Perhaps it’s too soon to give my impressions of Scottish schooling as the kids have only been at school for about a month but I’m going to do it anyway. My first impressions are wonderful. I can’t fault anything about education Scotland. Daniel has joined a composite year 4/5 class which worried us a little because he was doing year 3 in New Zealand. But he’s made leaps and bounds in just four weeks and his confidence in his abilities has improved considerably. He also gets lots of one-on-one support from a teaching assistant which makes a huge difference. They’ve already had a number of school trips and on each one we have been allowed to accompany him. This is great because Daniel is more anxious than most kids and likes to have one of us there when the routine changes. Unlike in England, we haven’t had to fill out forms for a police check in order to accompany our son on an excursion. Thanks goodness for that. All trips have been on foot too. No need for a bus in a walkable city. One thing that’s nice about the composite class is there are fewer kids in it. Since the teacher has to cope with a wider range of abilities, the class size is capped at 25 which is 8 fewer than would be the case if it was just year 4 or year 5. I asked his teacher about this and she said it made a huge difference. Elizabeth has also slotted in as a first-time school kid with ease. She started about a month and a half after all the other new entrants but has managed to catch up and is doing really well. They teach phonics here when kids are learning to read which means that rather than saying the letter names she has to say the sounds they make. I think Daniel would have found learning to read much easier with this method. Elizabeth would have been fine either way. There are no school fees in the UK. State schooling is completely free. I’ve always thought this should be the case in New Zealand too. I don’t think there’s a better way to spend tax-payer money than on good state schooling. Not only is schooling free here, but the school also provides all the stationery and books. Parents don’t have to pay anything at all. This is very generous. They also give all primary 1 students free milk and morning tea. Personally I think this is going a bit far with the generosity but perhaps I just object to the milk on ethical grounds more than anything else. I don’t think they really need to provide free milk to kids in schools. What’s wrong with water? Elizabeth likes it though. I also really like what I’ve seen of the curriculum so far. Elizabeth has been learning about forces and friction. She’s still only four but learning physics in a way that she seems to be enjoying. They’ve also been learning about Guy Fawkes and the Northern Lights. Daniel doesn’t tell us very much about what he does at school so I’m more in the dark on that one but I get information from his teacher. There’s a fantastic online mathematics game which kids can play called sumdog. It’s terrific. Daniel actually asks to play it. Having access to good quality schooling makes a tremendous difference when you’re a parent. There’s nothing better than knowing your kids are being cared for and are well-looked after. It’s a huge relief. Anyway, that’s all for now. 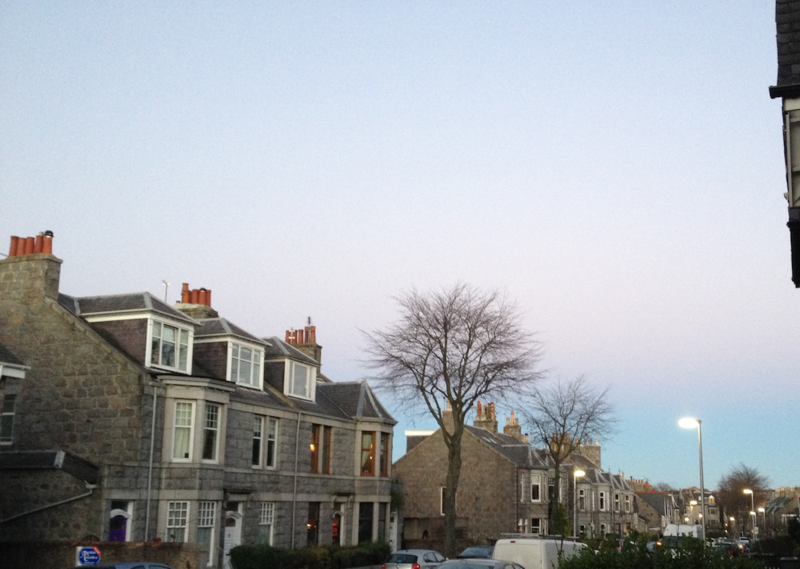 I took this photo of an Aberdeen street recently because I loved the purple hues in the sky. It is nice to read about a parent who praises their child’s school. I don’t think it’s too early to evaluate the school. We start evaluating things from the minute we meet them. And you can change your opinion anytime you want. 🙂 And as I have commented elsewhere, you do back up your opinion/evaluation with some reasoning. As a former teacher I have seen/heard many parents criticizing something about a school….. procedures/lunches/teachers/recess/busing/costs. And the list goes on. And there is much to criticize and improvements are always needed. There is often so little a teacher can do but try to give the children she has in her care for a year the best of her teaching skills. I work in a school and yeah all this is true! I have two in school and am very grateful to teachers for all their work. You should be proud of what you did. But I think I know a little of how you feel. It’s always moan moan from the public and government towards teachers, no appreciation of what a tough job it is for little reward. I think teachers do an amazing job, I really do. I can’t fault my children’s teacher in any way. It must be such an exhausting job. I agree that there’s a place for constructive criticism and that I should be a part of the solution instead of just complaining about it. There is one thing I’d like to change about the school and that is the playground. School playgrounds here don’t have things to play on like monkey bars, climbing frames and slides. It’s very strange. But my plan is to make it onto some parent’s committee at some point and find out whether there’s a reason for this. It might be a health and safety thing. So pleased that everything is working out so well with the kids’ school and schooling. I’m glad everything is working well for them. It’s a big part of child’s life, and whether happy and at ease or not makes a big difference. It’s also good to see what can be done with state education when people try. I used to get milk at school and hated it. I still wouldn’t drink a whole glass of milk now. It is too rich. My mum wrote a note in the end to stop me having it! I was allowed to have water instead. We had plenty of milk in cereal at breakfast at home. Yes that’s true, it was good for some to get their nutrition that way. What is also funny is that at the age of 5, the bottle seemed like a full sized pint bottle. It’s only as an adult that someone told me they were mini bottles. Yes, I remember that and often freezing cold on a cold winters morning and it wasn’t optional. Yes, I’m sure there’s a good case for giving food to kids in poorer areas or from poor families. We can afford it though. Starting from January next year kids in years 1-3 will all get free school dinners! That’s amazing. We can afford the 2 pounds for the school dinner so it seems a bit a drain on the system to give it to us and people like us for free. I have a blogging friend who lives near Dundee. She has two Aspie sons, and they are not getting enough support, and one is getting picked on too. I think education is variable over the UK depending on how well the individual school is run, which depends on attracting a good head and leader. Our system itself is quite high pressure regarding levels of achievement and progress, with lots of pressure on senior leaders to get it right, so for the majority of schools, the provision for children seems to be good and individualised. We don’t know how lucky we are in this country, as you say, everything is free and the principle is that it should remain so. Ok, I had wondered how much of my good experience was just that this was an exceptional school or whether it’s like this everywhere. The school in York was great also but I think this one is even better. A lot does depend on the head teacher and the head teacher at this school is terrific. I’m sorry to hear about your friend. Has she considered moving to a different school? I asked her that, because it did sound like what she was describing was not normal and not something she should be putting up with, but she said the schools are all over subscribed in her area. I’m glad it’s all going well at school, it’s brilliant how quickly you’ve all settled in. Who appears in Christmas parades in Aberdeen?